KMAT Kerala 2019: University of Kerala will conduct the Kerala Management Aptitude Test also known as KMAT Kerala in the month of February under the supervision of Admission Supervisory Committee and Fee Regulatory Committee for Professional Colleges of Kerala. Latest Update: KMAT Kerala 2019 Admit Card Released. Login on the official website to download it. Latest Update: KMAT Kerala 2019 Registration has been started. Check The Last Date and Registration Procedure Below. 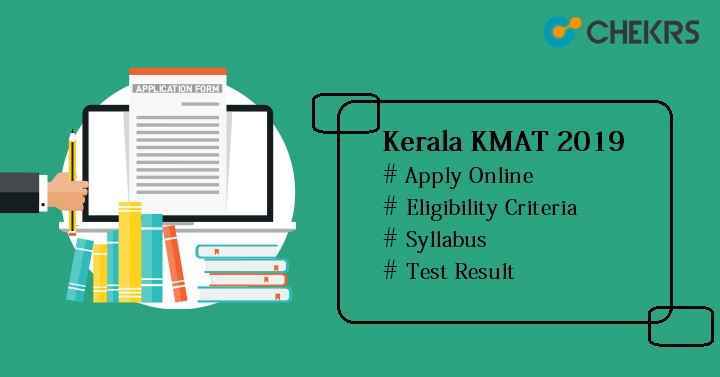 Latest Update: KMAT Kerala 2019 Registration Dates and Exam Date Announced!! Check The Table Below. It provides admission in MBA course in various private and government management institutions in Kerala state. This exam is held twice in a year. All interested candidates can apply for the KMAT Kerala Registration Form after releasing on the official site. Based on the performance of the candidates in the entrance exam followed by GD & PI, aspirants will get admission for the MBA courses in the institutions of management in the state of Kerala. Get here the all basic information about the KMAT Kerala Exam 2019. Candidates are suggested to go through the tentative exam schedules of Kerala KMAT 2019. Applicants must be an Indian citizen. He/ She must belong to Kerala or have domicile of Kerala state. Candidates must have a Bachelor’s degree from any recognized university of Kerala state or outside Kerala. Candidates appearing for the final year examination can also apply for the KMAT Kerala Exam. Students, who will appear for the KMAT exam, will have to obtain minimum 50% aggregate marks in graduation. Kerala KMAT Online Registration will start from the month of November. Firstly, candidates will have to do registration, then they will move to the next step i.e. filling-up of the application form. Candidates can fill the application through online mode only and must submit it before the last date. Follow the given official link kmatkerala.in. Click on the link “KMAT -2019 Online Registration” available on the top of the home page of website. Fill the all required details like candidate’s name, date of birth, mobile no, mail id etc and then submit it. After registration, an application no & password will be generated. To continue for the application process, click on “Click Here” present on the same page. Login the asked details and then sign it to the account. Fill the other required details. Select exam center and upload the scanned images such as photograph & signature. Pay the examination as well as application fee through online payment i.e. net banking/ credit card/ debit card according to your category. See the given below application fee table. Check Complete Details of KMAT Kerala Syllabus Below. Sentence Correction, Word usage, Fill in the blanks, Para Jumble, Para-completion,Fact Inference Judgement etc. Cover the entire syllabus and focus on each & every topic. Practice online mock tests regularly. Make points on important topic and revise on regular basis. Take the help of good reference books. Manage the time during the exam; try to solve the easy question first and then move on the difficult one. KMAT Kerala Hall Ticket will be available on the official website from the last week of January. Applicants who will submit the form successfully, will be able to download the admit card. Candidates will have to bring the KMAT Kerala Admit Card with the ID proof while appearing for the examination. Follow the steps to download the admit card. Go to the official portal of KMAT Kerala. Login to the candidate’s login account by entering the login credentials. After login to the account, the admit card will be appeared on the screen. Download it and take the print of it to appear in the exam. The official authority of University of Kerala will publish the KMAT Kerala Answer Key within a week on its official portal. Candidates can check the answer key and match it with their own answers to estimate the KMAT exam score. The answer key will be available in the pdf format. If the uploaded answer key will be wrong, then applicant can also fill the objection form within the date. In order to get the Kerala KMAT Score Card, access the official site. Login to the candidate’s account with the registered id & password. After login, the result will appear in the PDF format with application no, roll no, name, marks, rank etc. Take the print of downloaded result for the admission procedure. KMAT Kerala Cutoff will be released on the date of result declaration through online mode. It will be prepared according to the category-wise. Cutoff marks will be the minimum required score to get qualify in the exam. Students will have to score equal to the cutoff marks or above the minimum percentile. It will be based on various parameters like seats availability, previous year cutoff, difficulty level of paper, no of candidates appeared in the exam etc. The authority of Kerala University will prepare KEAM Kerala Rank List, including the name of candidates who will score the cutoff marks or above the cutoff. Based on the rank list or merit list, candidates will be invited for the KMAT Kerala Counselling. Candidates will get seat according to their marks or rank scored by them. The admission will be done based on the entrance exam marks followed by the GD & PI. Candidates will have to report at the university with the relevant or required documents for verification.